New Delhi July 12 (IANS) A plea in the National Green Tribunal (NGT) here on Thursday sought stay on the construction of a 70 storey temple being built by ISKCON in Uttar Pradesh s Vrindavan claiming it will lead to a drop in ground water and harm the environment. 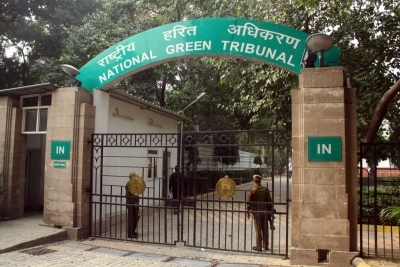 Accepting the plea a bench headed by NGT Chairperson Justice Adarsh Kumar Goel issued notice to ISKCON and the Central Ground Water Authority returnable by July 31. Claiming the construction as illegal "under the false pretence of religious tourism" the plea claims that the construction will further deteriorate the condition of river Yamuna. Being built by the International Society for Krishna Consciousness (ISKCON) the Vrindavan Chandrodaya Mandir aimed to be tallest religious structure in the world. Its foundation stone was laid by then President Pranab Mukherjee on November 16 2014. Demanding immediate halt of the temple construction the plea filed by Manikesh Chaturvedi also claimed that the land on which the temple is being constructed is disputed by Vrindavan Municipality. "This proposed costruction is to be leveraged with an artificial river within the four boundaries of the planned construction. This water for artificial construction is to be extracted out from the ground which is likely to reduce the ground water level extending to non-existence of the river Yamuna " the plea claimed adding that the river and religious sentiments associated with Yamuna are for everyone. The temple is being constructed over an area of 62 acres while the structure alone will cover five acres of land.